When we last reported on it, Amazon was still considering both Long Island City and Arlington, Virginia as the location for its second headquarters. Originally, there were some 230 cities considered for the headquarters, and the list narrowed until these two locations were left. There was also the possibility that the new headquarters, nicknamed “HQ2” would be split between the two locations. And now, it looks like that’s exactly what’s going to happen. According to recent reports, the new headquarters will be split between Long Island City and the Crystal City area of Arlington, near Washington, DC. These locations are projected to each employ 25,000 people in advertising, marketing, tech roles, and more. As part of the deal, New York State has agreed to provide Amazon with $1.5 billion in economic incentives. $1.2 billion of that includes tax credits. But not everyone is as pleased about the prospect as they are. 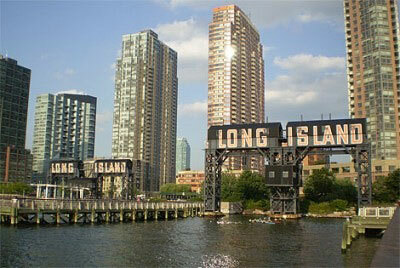 They objected to the way that they perceived New York City officials as trying to appeal to the company. “The burden should not be on the 99 percent to prove we are worthy of the 1 percent’s presence in our communities, but rather on Amazon to prove it would be a responsible corporate neighbor,” their statement said. 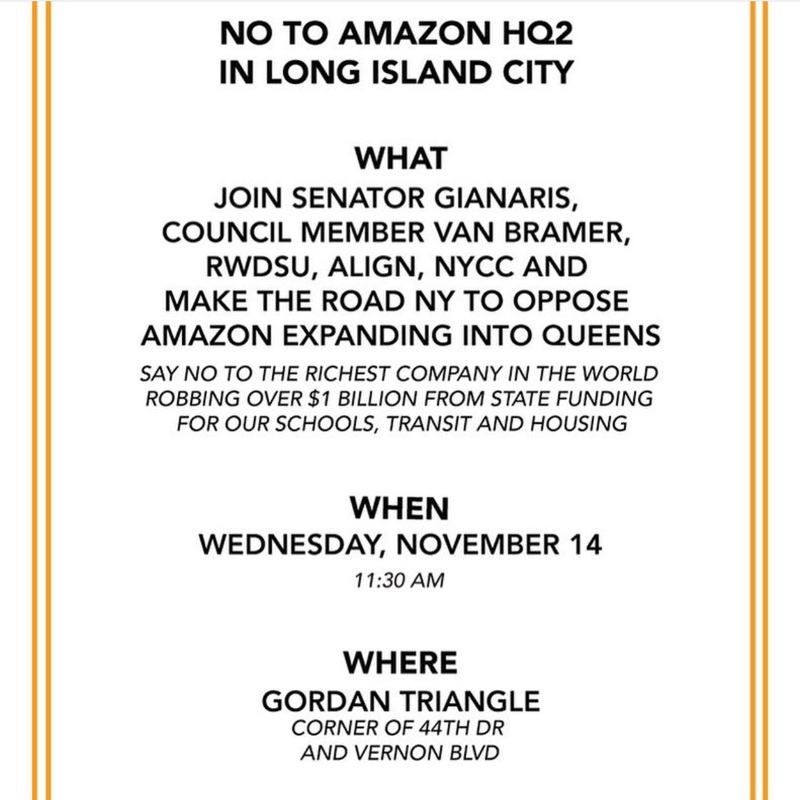 On an Instagram post, Council Member Van Bramer released this flyer for a rally opposing the presence of Amazon. Other concerns about Amazon moving in include what might happen to housing costs, and how the already overburdened public transit system might fare with an influx of new commuters. Proponents of the new headquarters, however, say that people should be more focused on the long-term benefits that Amazon’s presence could bring to the city. Right now, it seems that the corporate headquarters will be constructed on the East River between 44th Road and 46th Avenue, along Vernon Boulevard. As far as we know, the rally against HQ2 is still going to take place, and various neighborhood organizations are hosting meetings and events regarding the decision, where Queens residents can voice their questions and concerns. What are your feelings about this potentially monumental change to the area? Are you looking forward to new economic opportunities, or would you rather the corporation stay away? Let us know in the comments! My concern is that it will change the community I now call home and have grown so fond of. I’m from CA and I see what has become of San Francisco since the tech boom. I don’t want that to happen here. I also agree that the Subway situation is completely out of control and I don’t know how it could possibly handle any major influx of riders. I have seen that movie before approximately 20 Years ago there was a movement against residential development in Long Island city. Time has proven that movement was wrong . For me, it’s not an issue of welcoming Amazon or opposing it—it’s about ensuring the terms under which Amazon proposes to join our community are fair and just. I wouldn’t characterize all people raising concerns about the proposed Amazon deal as uniformly opposed to Amazon coming here under any circumstances. That’s not what I’m hearing in their comments, anyway, and that’s not how I personal feel about it. But with no community input into the process and a billion dollars of our money and strategically advantageous city data being thrown at a mammoth private corporation that doesn’t need it, there are fair questions to be raised about whether this deal as it stands now is right for us.